Knit the vibrant Ojo de Dios Shawl with Plymouth's self-striping Gina yarn with this Interweave Knits winter 2014 kit. Knit the vibrant, colorful Ojo de Dios Shawl designed by Vanessa Ewing! 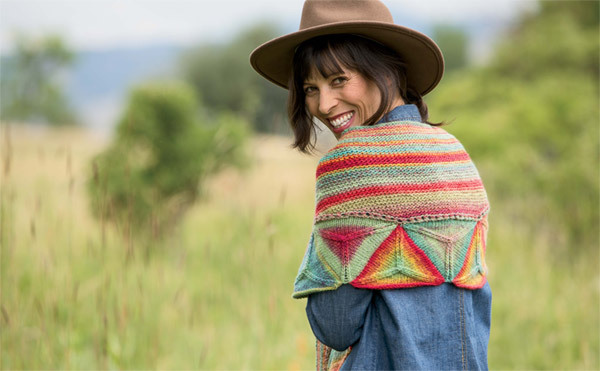 This exclusive knitting kit includes everything you need to make your own Ojo de Dios Shawl in the colors shown in the Winter 2014 issue of Interweave Knits magazine. Hurry! We have a limited supply of knitting kits. Order yours today while supplies last. 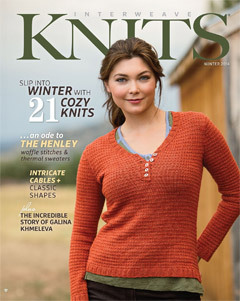 The Winter 2014 issue of Interweave Knits magazine! This collection celebrates knitting as outwear, with generous jackets, whimsical accessories, and classic pullovers. Study southwestern-inspired projects that revel in color, motif, and silhouette. Plus, take you cable knitting further with timeless Arans in contemporary palettes. This issue also features rugged knitwear and beautiful, delicate lace from Galina Khmeleva. The pattern for the Ojo de Dios Shawl by Vanessa Ewing! This vibrant shawl's pattern is included in the Winter 2014 issue of Interweave Knits magazine. Self-striping yarn creates an intriguing effect in the motifs featured in this knitted shawl. The crescent-shaped wrap is built of modular triangles and garter stitch shaped with short-rows. 6 balls of Plymouth Yarn's Gina in #0005 Sunset, as seen in Interweave Knits. This 100% wool, single ply yarn has a bright, lively self-striping palette that turns heads. Each ball of Gina has 109 yards and 50g of yarn. This kit includes enough yarn to knit the Ojo de Dios Shawl exactly as it is pictured in Interweave Knits magazine. Colors may vary slightly from what you see here. Order your Ojo de Dios Knitted Shawl Kit today while supplies last!